After Dracula, this is probably the most famous Gothic text ever written, and with good reason. 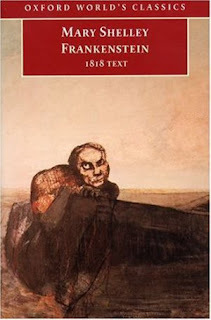 Like with Dracula, this was not the first time that I had read Frankenstein, I just haven't read it in a long time. As you can see, I've specified the edition of the text that I re-read, as there are differences between the two; the more widely read 1831 edition apparently toned down a fair few elements from the original edition, which I was quite glad to avoid. Anyway, on to the question of how it held up compared to my memories of it. Frankenstein: Or The Modern Prometheus starts with an explorer making an expedition into the Arctic, in an effort to map it. Along the way, he and his crew pick up a man stranded on a chunk of ice: this man is Victor Frankenstein, and his narrative explaining his life and how he ended up in the Arctic. This story is one that everyone knows: as a young student of natural philosophy, Frankenstein creates a creature from the body parts of the dead and brings it to life, creating a being that will eventually destroy everything that he holds dear. I love this book. In my eyes, it is probably the pinnacle of what can be achieved in Gothic fiction, as well as a perfect example of a tragedy. While it is easy to sympathise with Frankenstein in the beginning, it is only when we hear the Creature's side of the story that we begin to see that his actions are by no means entirely good or commendable. On the one hand, I can understand Frankenstein's horror at realising the inhuman nature of the creature that he has created and accidentally let loose, especially considering the physical and mental exhaustion following the Creature's birth; on the other, the Creature is initially a benevolent and rational being, forced into a role of villain after being shunned by every human whose path he crosses. It is a conflict that could be easily solved, but the obstinacy of both parties prevents that from happening, with tragic consequences. I would discuss this in more detail, but it is a story that I think must be experienced personally; besides, who in the world doesn't know this story in some capacity?